FORT MYERS, Fla. - The Fort Myers Miracle saw their 22-inning scoreless streak snapped in a 5-0 loss to the Dunedin Blue Jays on Thursday night at Hammond Stadium. After not allowing a run in 21 innings entering the night, the Miracle pushed their shutout streak to 22 with a scoreless top of the first. The streak ended the following inning when Cullen Large drove a Jhoan Duran fastball over the wall in right. In the third, Cal Stevenson extended the lead to 2-0 with an RBI groundout. Still down 2-0 in the seventh, Shortstop Royce Lewis saved the game momentarily with a diving catch to his right with the bases loaded. It looked like the Miracle would build off the momentum when they put runners at first and third in the bottom of the inning. But Aaron Whitefield struck out swinging on a slider to end the threat. The Blue Jays broke the game open in the eighth. Melvi Acosta's second wild pitch of the inning yielded a run before Ryan Noda crushed a two-run home run to right to push the lead to 5-0. Duran (0-1) suffered the loss after allowing two runs across five innings of work. The right-hander walked one and struck out five. Nick Allgeyer (1-0) earned his first professional win with five scoreless innings. Allgeyer scattered two hits and did not walk a batter. He fanned five. 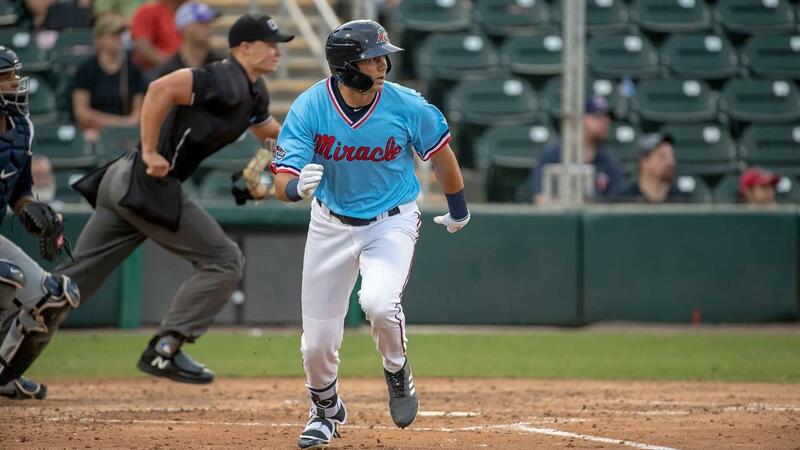 The Miracle begin their first overnight road trip of the season on Friday night when they travel to Clearwater to take on the Threshers, the Class-A Advanced affiliate of the Philadelphia Phillies. Left-hander Tyler Watson (0-1, 7.20) looks to bounce back after surrendering four runs in five innings in his first start of the season. First pitch is scheduled for 6:30 p.m.